Although the majority of hard of hearing and deaf persons speak and prefer Auditory Oral (AO) communication (known as the Speaking Deaf Community) there is also a strong and active portion of our community who rely on and prefer to communicate visually (the Signing Deaf Community). The majority of the Signing Deaf Community prefers to use ASL (American Sign Language). There are other communication methods including Cued Speech, SEE (Signed Exact English), TC (total communication), and LSL (Listening and Spoken Language). The Deaf Communitiy (TDC) banded together because many local, national and international organizations of the deaf and hard of hearing claim to represent ALL deaf people when they blatantly don't. So, we decided to take the name back! The truth is that no one speaks for the whole community. If we were to base the title “The Deaf Community” on the basis of the communication method used by the majority of deaf people, we would have to state that the deaf community prefers spoken communication. Our goal is not to promote spoken communication or signed communication or any other form of communication, but to provide a rational alternative voice based upon what people are choosing and research. We have observed backlash from the Signing Deaf Community against the Speaking Deaf Community in the last few years. 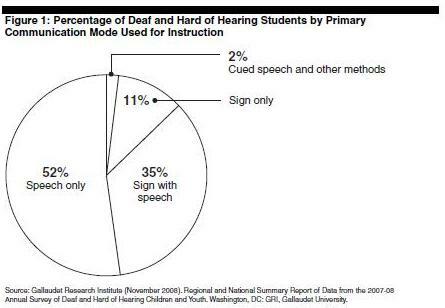 Most states in the U.S. allocate the majority of resources for deaf people to the Signing Deaf Community. The resources are not equal among the community and often the youngest of our community suffer and are denied access to options. So while some of our own leadership prefer to sign, we have to work together with the speaking community too. Over time and extreme militant manifestation, the "deaf community" has come to be represented as people who share the culture and commonality of ASL. Anyone else is an outsider. Any other communication method, especially speaking (voice on), is often shunned and not considered part of the culture.... or our community. This has to stop too. With technological advances such as the growing popularity of cochlear implants, signing deaf militants have taken to bullying, public attacks, public cyber threats and thuggish tactics to silence the other deaf communication options and proponents of the Speaking Deaf Community. We will not put up with Deaf bullies on this site. We define Deaf bullies as people who try and force their choices on the entire community. We define bullies as those who attack and belittle children or parents. We define Deaf bullies as organizations that attempt to usurp everyone’s voices through aggression and a refusal to engage in civil discourse in a respectful manner. We define bullies as groups and individuals that attack proponents of either the Signing or Speaking Deaf Communities in a negative way by engaging in mudslinging, intimidation, and slander. We will use this platform to endorse activities, programs, individuals, and legislation which foster opportunity and growth for the whole community. This does not imply that we do not respect individuals and organizations that are devoted to championing a specific communication modality, but we will not allow a single point of view to “speak” for all of us. Graph taken from 2011 United States Government Accountability Office (GAO) Report. For the full report, please visit our "resources" page. If there is something going on in your state that merits support, we will write a letter of support and list your activity, event, opportunity, or legislation here on our website. Haters - Members may endorse a method they personally support, but must be respectful of all choices. Vultures - Companies that sell services or products to our community. We are aware that organizations such as NAD and AG Bell give credence to “corporate sponsors. NAD even gives them voting blocks. We have decided that vendors (hearing aid companies, interpreting services, captioning companies, relay services, or implant manufacturers) should not have a greater voice than the individuals and families that belong to our community as a whole. Bullies – if you are caught calling for the denouncement of individuals, trolling for information to use against individuals, creating petitions designed to remove all choice or hamper free speech, engaging in a campaign to get a person fired based on communication modality, or attempt to silence or take the rights of deaf individuals, parents, advocates or professionals within the community, you will lose your membership.